Marvel Two-in-One #33: From Stonehenge.. with Death! Four elementals: Aero, Hydro, Fire, Mud. Ben and Alicia are engaged in a passionate smooch after the unhappy events of the last several issues, everything being mostly back to normal. Ben wants to head back to North America, but Alicia is determined to finish her vacation and visit Stonehenge. The two are soon piled into the car and on their way out into the country. Page 10, panel 1. Clobberin' Timus Interruptus: Ben is climbing back up from a crevice he was dropped into: "Cause as soon as I get my size twenty feetsies touchin' ground-- it's gonna be Clobberin' Time!" Unfortunately, they're all teleported into an underground cave before that can happen! At the end of this issue, Modred erases all memory from Ben and Alicia's mind of the bad stuff that happened to them on their London trip, those basically being Spider-woman, Alicia's transformation, and this issue's adventures. Future writers actually remember this too- when Spider-woman appears again in issue 85, Ben doesn't know her but comments to himself that there's something very familiar about her. Same thing when Modred appears in MTIO 74- Modred has lost his memories, and neither he nor Ben recognize each other. Modred the Mystic had a couple issue shot in Marvel Chillers 1-2 before appearing here. No one ever seems to have gotten a good grasp on Modred- he's occasionally a baddie, occasionally a good guy, and even for a while reduced to the mind of a child. Of course, even from the start he's written as somewhat mixed- an apparently good guy driven into dealing with (and getting messed over by) the Darkhold. Its in his childlike state that he next appears again in MTIO, in issue 74. He does get a good, if short, usage before that in The Yesterday Quest, an Avengers storyline (issues 185-187, also reprinted as a trade paperback, however) which is something of a classic for resolving the histories of Quicksilver and the Scarlet Witch and setting up the eventual revelation of Magneto as their father. This whole London run has been a kind of second-stringers delight- take a handful of characters either recently cancelled or recently created or just looking for their own titles (Nick Fury, Deathlok, Spider-woman, Modred) and throw them all in. Its never said outright, but its _very_ strongly indicated that these demons are awoken or invoked or just irritated by the mysterious burglars of the past few issues- the ones who got sucked into a chest a few issues back are in the caves here. I do wonder if the mysterious chest ever appeared again, though, as the whole thing doesn't quite make sense. If the demons were already up and hunting through time for Modred, what did the chest have to do with anything? Modred also clears up for us the rather yucky idea Supreme Hydra had told Spider-woman in Marvel Spotlight 32, that she was actually an evolved spider. Modred does assure her that she's human. For my own part, I wonder if reader reaction to the evolved spider idea was bad enough that it had to be retconned away, or if it was all intended as a Supreme Hydra ruse to keep the character off-balance. So, I'm unpacking donated children's books at the public library I work at, and look what I found! This 1984 British reprint magazine includes MTIO 33, as well as both stories from X-Men (the original team, ca. the 1960s) issue 48, and the back-up story from X-Men 57. You have to love that cover... "The Thing is Big Ben" and "Ol' blue-eyes is back!" Very fun! 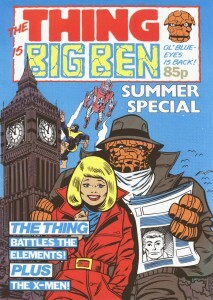 It appears that this was a summer special for a weekly British reprint series actually titled "The Thing is Big Ben", which ran a whole 18 issues in 1984, and reprinted MTIO issues 92-100. My final note- though the British have a lot of fun with this, they don't quite have Ben's voice down in the blurb at the start of the issue... "Hi gang, welcome to my sunny Summer Special, and boy is it special." And a little later: "There's heaps more fun with my puzzle pages..." Hmm, well, I guess the American writers mangle British dialogue, so its only fair. Great title for the text page before the story starts, though... "Fist & Foremost".